At Lumel Studios we take for granted that human's are smart, have a healthy fear of 1200 C molten glass and have wonderfully creative instincts! In fact we are trying to grow future glass blowers and from experience we know that working with hot glass is positively addictive and engaging. Have a look at 'Lumel sights and sounds - become a glass blower it's a great job! ', the video shows us working but you too have the ability to join us. Usually working with molten glass takes 2 people but at Lumel we offer individual sessions to provide a taste of glass blowing. These sessions allow you to experience the heat and properties of glass, and you also create a piece to take home. 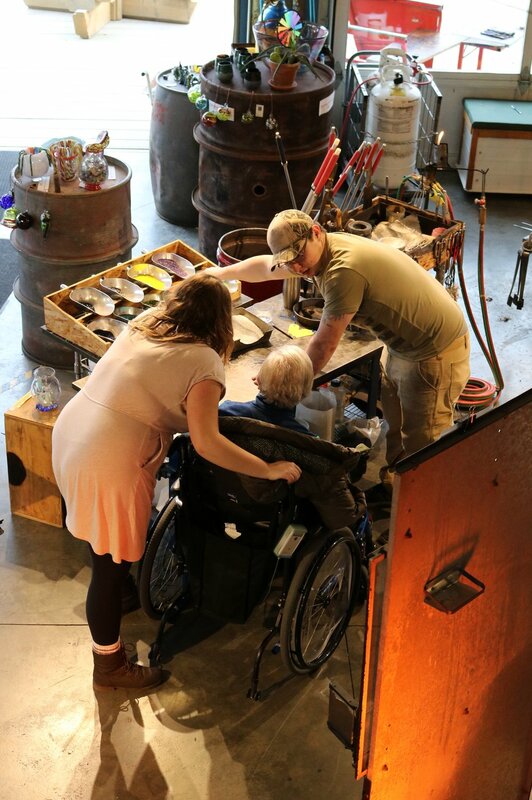 This experience gives you an idea of the skill that is necessary in working with molten glass. Lumels' days can get booked up quickly, so be sure to phone ahead if you have the ability to book a specific time. Introductory creations for all ages and abilities. We want to provide an opportunity for you to bring someone special to the studio and have fun creating together. A hot date night fulfils that purpose. Date nights are for couples of any description: friends, parent/guardian and child, family groups, workplace partners, etc. Partnership is an aspect of glass blowing that is very important and most times essential in creating glass pieces with skill and finesse; very few glass artists work alone. · Suitable for friends, significant others, pets and owners – you name the pair or the family! Our longer workshops give participants more time for experimentation and practice. You will get much more of a sense of the skill that is needed to produce stylized glass pieces. You will learn to work in partnership, an aspect of glass blowing that is very important in creating glass pieces with skill and finesse. Very few glass artists work alone – most work in pairs or groups. Our three to 18 hour workshops are designed to be booked over multiple sittings. · Make tumblers, bowls, sculptural pieces, etc. · Create tumblers, bowls, vases, sculptural pieces, etc.